Item # 317174 Stash Points: 2,795 (?) This is the number of points you get in The Zumiez Stash for purchasing this item. Stash points are redeemable for exclusive rewards only available to Zumiez Stash members. To redeem your points check out the rewards catalog on thestash.zumiez.com. Give you wardrobe a splash of eerie style with the Mishka Baby Doll Light Blue T-Shirt. Light blue throughout, this tagless and relaxed fit t-shirt features the image of a young girl holding a baby doll, but instead of faces both have large eye balls instead for a creepy and original look. 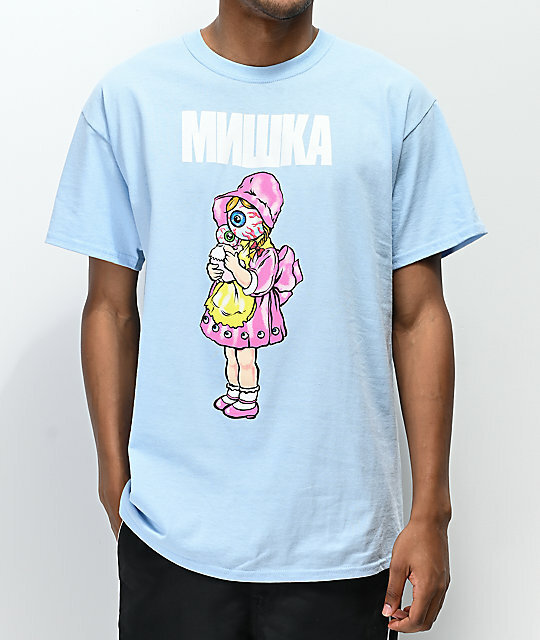 Baby Doll Light Blue T-Shirt from Mishka. Screen-printed graphic of a little girl with a baby both with eye balls for heads.